Moskva, 2004. First Edition. Hardcover. Large quarto (30cm. ); publisher's tan photo-illustrated paper-covered boards; 543pp. ; color photographic illus. throughout. A few minor bumps along top edges of boards, else Near Fine. Comprehensive guide to medals of honor issued by the Russian Ministry of Internal Affairs. Text entirely in Russian. By [COMMUNISTS] DEWEY, John et al. New York: Harper & Brothers, 1938. First Edition. Paperback. 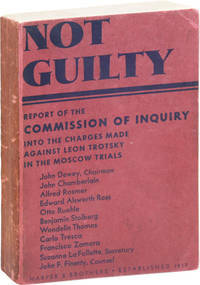 The second volume issued by the Dewey Commission, an independent tribunal of left-leaning intellectuals assembled to investigate the Comintern's accusations against Trotsky and his faction, the first volume being "The Case of Leon Trotsky" (1937). Wrapper issue. Octavo (21cm. ); publisher's dark red card wrappers; xv,,422pp. Some shelf wear and surface scratches mid-spine, light dust-soil, else Very Good and sound. Brooklyn: Lavoratori Industriali del Mondo [Industrial Workers of the World / I.W.W. ], N.d. [1919-1920]. First Edition. Pamphlet. 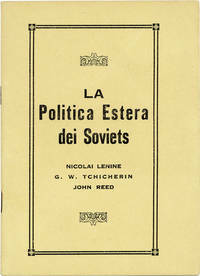 Articles by Lenin, Tchicherin and Reed on post-revolutionary Soviet foreign policy. Unusual in that there does not appear to have been an English-language equivalent; this would appear to have been an entirely local production of the Brooklyn-based Italian-language delegation of the I.W.W. Not in Miles; OCLC notes two locations only (Labadie, Hoover Inst). 12mo (17cm). Staple-bound pamphlet; printed paper wrappers; 51pp. A bright, unworn copy; Near Fine. Text entirely in Italian. Warsaw: Fundacja Polskiej Sztuki Nowoczesnej & Wydawnictwa Artystyczne i Filmowe Ltd, 1994. First Edition. Hardcover. Quarto (32.5cm x 24cm). Pictorial paper boards (hardcover); 448pp; illus. Very Good + copy; slight shelf wear to corner tips; two slightly bumped corners, else clean and tight. 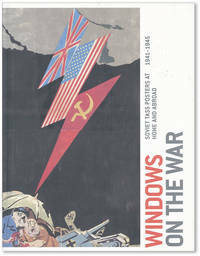 Catalogue published in conjunction with a 1994 exhibition held in Warsaw and in St. Petersburg that explored the works of Socialist Realism juxtaposed with avant-garde art of the Soviet Union from the 1950s to the 1980s. New York: The Museum of Modern Art, New York, 1999. Third Printing. Paperback. Quarto (30.5cm x 23cm). Pictorial wrappers (softcover); 96pp; illus. Fine copy, appears new. 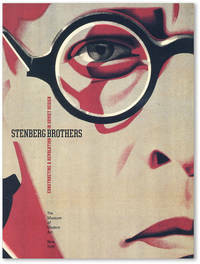 Catalogue for the exhibition "Stenberg Brothers: Constructing a Revolution in Soviet Design" organized and held at The Museum of Modern Art, New York in 1997, focusing on the Stenberg's film posters. Richly illustrated with essays by the exhibition's curator Christopher Mount and by Peter Kenez. Leningrad: Aurora Art Publishers, 1986. First Edition. Hardcover. Quarto (32.5cm x 29.5cm). Red cloth boards (hardcover) with titling blind-stamped on cover and embossed in white on spine; pictorial dustjacket; cardboard slipcase; 27pp + 157 plates; illus. Near Fine copy; one dust streak on cover, else appears new. Near Fine dustwrapper; very slight shelf wear to extremities. Very Good slipcase; shelf wear and sunfading to extremities. 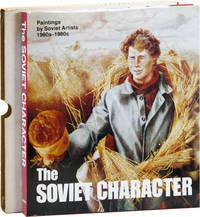 An overview of the prevailing artistic tendencies, achievements, and issues of Soviet art from the 1960s to the 1980s. 157 color plates. New York: Rizzoli, 1986. First Edition. Hardcover. Quarto (28.5cm x 22.5cm). Blue cloth boards (hardcover) with titing blind-stamped on cover and embossed in light blue on spine; 220pp; illus. Near Fine copy; slight dust soiling to fron cover, else clean and tight. Good dustwrapper; tear to upper back panel. 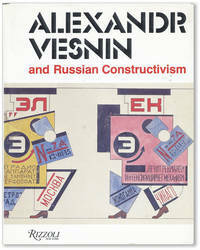 First major study of architect, theater designer, painter, graphic artist, and major figure in the Russian Constructivist movement Alexandr Vesnin to appear in English. Hundreds of illustrations in color and b&w. St. Petersburg: Palace Edition / The State Russian Museum, 1997. First Edition. Hardcover. Quarto (30.5cm x 25.5cm). Pictorical paper boards (hardcover); 184pp; illus. Near Fine copy; very slight shelfwear to corner tips, else clean and tight. 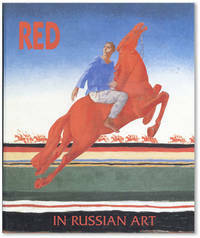 Catalogue published on the occasion of an exhibition of works from the State Russian Museum devoted to the color red in Russian art. 207 color reproductions. Leningrad: Aurora Art Publishers, 1991. First English Language Edition. Hardcover. Quarto (29.5cm x 25cm). Pictorial paper over black cloth boards (hardcover) with titling embossed in white on spine; pictorial dustjacket; slipcase; 200pp; illus. Fine copy; appears new. Fine dustwrapper, appears new. Very Good slip case; shelf wear to extremities. An exploration of the nexus between Russian painted shop signs and avant-garde artists. 275 illustrations in color and b&w. Chicago: Art Institute of Chicago / Yale, 2011. First Edition. Hardcover. Folio (32.5cm x 25.5cm). Pictorial paper boards (hardcover); ,400pp. ; chiefly illus. Near Fine copy, slight shelf wear to extremities. Catalogue published to accompany the exhibition of the same name held at the Art Institute of Chicago in 2011. New York: Jefferson School of Social Science, n.d. but ca. 1945. First Thus. Paperback. 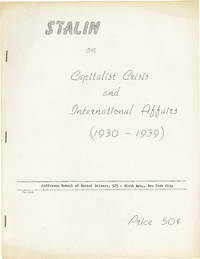 Compilation of three addresses delivered by Stalin, at the 16th, 17th, and 18th Congresses of the Communist Party of the Soviet Union. Published by the CPUSA-run Jefferson School of Social Science, successor to the New York Workers School. Date based on the founding of the Jefferson School in 1944. Quarto (27.5cm. ); publisher's grey mimeographed staplebound wrappers; 32ll. printed from typescript on rectos only. Wrapper extremities slightly toned and dust-soiled, else Very Good or better. Moskva: Voskresen'e, 1993. First Edition. Hardcover. Slim quarto (28cm. ); publisher's green pictorial textured paper-covered boards printed in white and gilt; 156pp. ; color illus. throughout, chiefly photographs. Corners gently bumped, else Near Fine. Bilingual text in Russian and English. 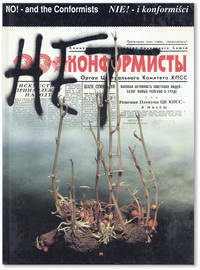 Moskva: "Prosveshchenie", 1997. First Edition. Hardcover. Slim quarto (29cm. ); publisher's blue pictorial paper-covered boards printed in red and gilt; 159pp. ; color photographic illus. throughout. Boards a bit bumped, a few leaves dog-eared, else Very Good and sound. 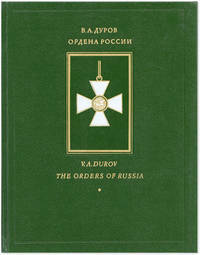 Guide to Russian military awards from the 18th to the 20th century. Text entirely in Russian. Boulder: Westview Press, . First Edition. Hardcover. Octavo (23cm. 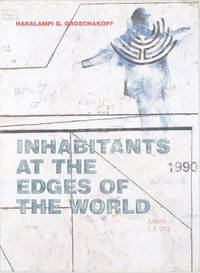 ); publisher's cloth in blue dust jacket; ix,,230pp. Light edge wear to jacket extremities, spine a shade sunned, else Near Fine. Forms part of the John M. Olin Critical Issues Series. New York: International Publishers, . First Edition. Paperback. 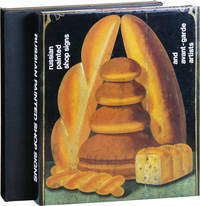 Quarto (28cm. ); publisher's white pictorial card wrappers; 96pp. ; full-page illus. throughout. Wrappers a bit toned, spine crown bumped, else Very Good or better. Collection of sketches made during the artist's travels through the Soviet Union, Romania, East Germany, and Bulgaria. By [SAMOKYSH, Nikolai] IATSENKO, V.F. Kyïv: Mistetstvo, 1979. First Edition. Hardcover. Slim quarto (28.5cm. ); publisher's limp leatherette boards in pictorial dust jacket; 98pp. ; chiefly illus. Boards very slightly bowed, light shelf wear, else Very Good and sound. 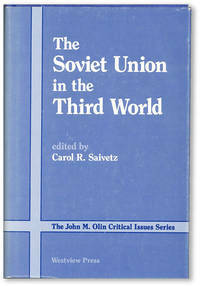 Trilingual text in Russian, Ukrainian, and English. 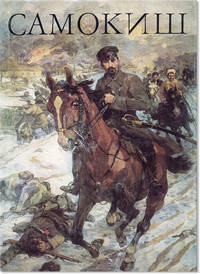 Catalog of works by the Soviet painter, best known for his military art. New York: Harry N. Abrams, Inc, 1989. First English Language Edition. Hardcover. Large Quarto (33.5cm x 26.5cm). Blue cloth boards (harcover) with gold embossed illustration embossed on cover and titling on spine; pictorial dustjacket; slipcover; 182pp; illus. Fine copy, appears new. Fine dustwrapper, appears new. Near Fine cardboard slipcover. 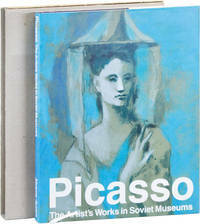 An examination and comprehsive catalogue of Pablo Picasso's works held in formerly Soviet museums. 680 illustrations, including 56 color plates and 3 gatefolds. Budapest: Hungexpo Budapest, 1987. First Edition. Paperback. Quarto (29cm x 21cm). White paper wrappers (softcover); pictorial dustjacket; 312 pp; illus. Near Fine copy; slight soiling to bottom textblock, else clean and tight. Near Fine dustwrapper; small tear to top spine panel, else clean. 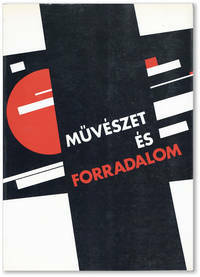 Catalogue of the first exhibition in Hungary exploring the full impact of the Russian-Soviet avant-garde during its most decisive decades. The exhibition "Art and Revolution: Russian-Soviet Art 1910-1932" was arranged on the occasion of the 70th anniversary of the October Revolution and was held at the Palace of Exhibitions, Budapest November 5, 1987-January 17, 1988 and at the Austrian Museum for Applied Arts, Vienna March-April 1988. Hundreds of photographic reproductions in color and b&w. In Hungarian and Enlish languages. 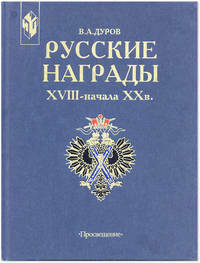 St. Petersburg: Palace Editions, 2001. First Edition. Hardcover. Quarto (32.5cm x 26cm). Pictorial paper boards (hardcover); pictorial dustjacket; pictorial slipcase; 382pp [vol. 1], 432pp [vol. 2]; compact disk recording; illus. Fine copy; appears new. Fine dustwrapper; appears new. Near Fine slipcase; bumped bottom panel; chipping to top edge back cover, else clean and tight. 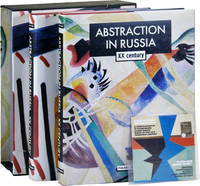 Survey of abstraction and its influence found in 20th century Russian visual art. Hundreds of artists profiled with color reproductions of their works and scholarly essays. Includes the compact disk recording "Pieces of Music for White Dots: A Compilation of St. Petersburg Avant-garde Music of the Late Twentieth Century". Edited by Yevgenia Petrova and translated from the Russian by Kenneth MacInnes. St. Petersburg: Berlin Press / The State Russian Museum, 1999. First Edition. Hardcover. Quarto (33.5cm x 24.5cm). Red cloth boards (hardcover) wit titling embossed in black on spine; pictorial dustjacket; 192pp; illus. Near Fine copy; slight shelf wear to bottom corners; slight soiling to bottom textblock, else clean and tight. Near Fine dustwrapper; slight shelf wear to extremities. In original shrink wrap. Critical examination of Russian-Austrian multimedia artist and theorist Haralampi Oroschakoff with scholarly essays, a conversation and text by the artist, and color plates of his work presented in the exhibition "Inhabitants at the Edges of the World". Texts in English, Russian, and German languages.